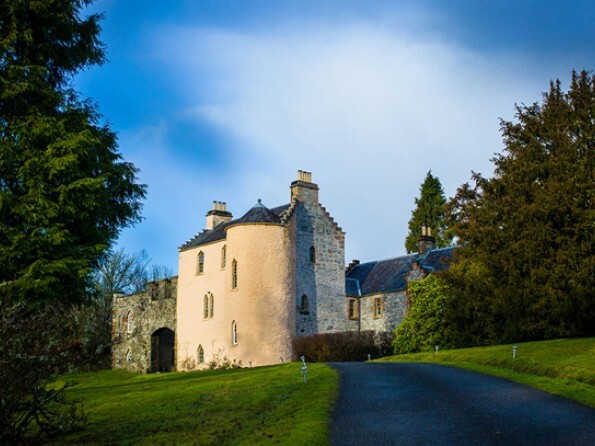 Nestled in the heart of the Queen Elizabeth Forest near Aberfoyle in Scotland and emanating history, character and atmosphere, Duchray Castle is a 500 year old tower house once linked with the infamous Rob Roy. Now newly renovated it offers luxury accommodation in a stunning secluded location. For larger groups, you can also book the West Wing and the Lodge. 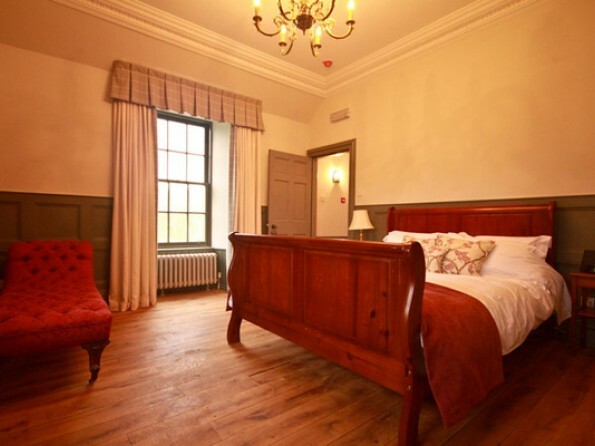 With 4 luxurious en-suite bedrooms, an impressive stone vaulted dining room, a snug and a full-equipped kitchen, Duchray Castle is the perfect bolthole for a discerning group of family and friends looking for comfort and elegance. 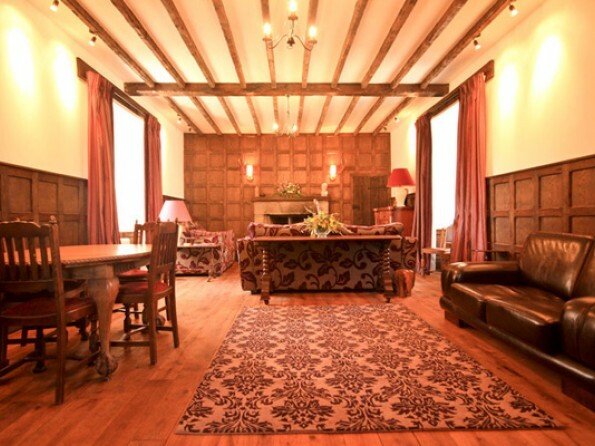 Relax in the Great Hall with its cosy fireside sofas and magnificent gothic windows that look out over the garden, snuggle up in the Welcome Hall with a book or game from our well stocked shelves, or plan a day out from the comfort of a fire side seat. 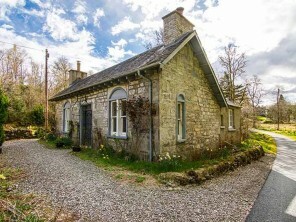 There’s plenty to do on the estate itself, or further afield you can play golf at the 18-hole course in Aberfoyle, go fishing at the Lake of Menteith fishery, bike along National Cycle Route 7, go horse riding nearby. 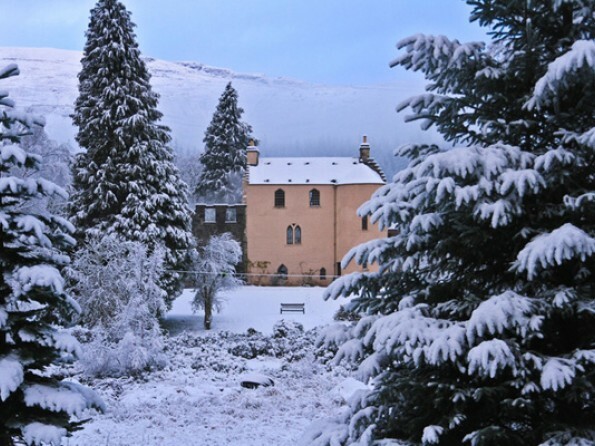 Red squirrel, deer and a huge variety of birds are frequently seen on the Castle estate. Our location in the heart of the forest means that miles of forest track are just outside our gates for walkers, cyclists and horse riders to enjoy. 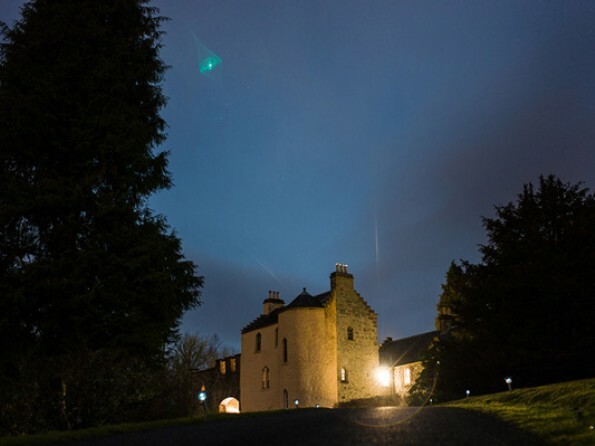 The tourist attractions of the Loch Lomond and Stirlingshire areas are easily accessible and the lack of light pollution allows superb opportunities for star gazing on clear nights. 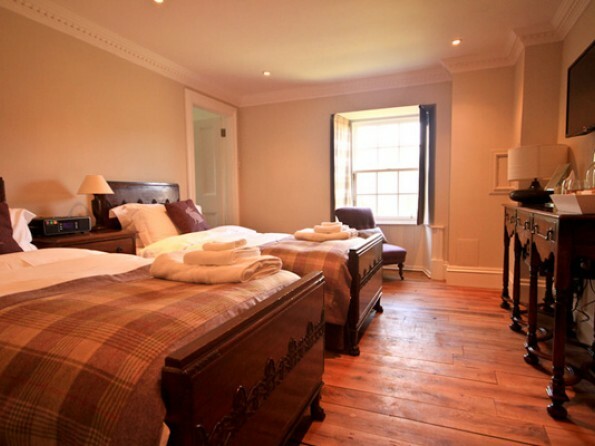 We are just a 1 hour drive from Edinburgh and Glasgow airports or there is a bus from Stirling to Aberfoyle which runs Monday - Saturday and takes just less than an hour. If you’re coming by car, Aberfoyle can be reached along the A81 from the south (Glasgow) or the A873 from the east (Stirling). See the website for detailed driving directions. There are two taxi companies based in Aberfoyle - both do airport transfers as well as local journeys. The accommodation comprises 3 double bedrooms and 1 twin. 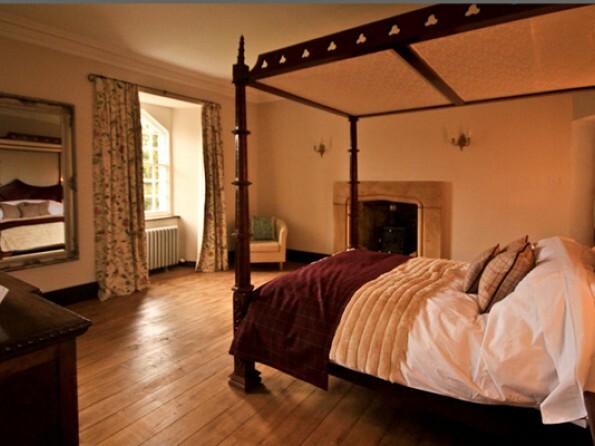 The largest bedroom, accessed via the original stone spiral stair case, occupies the whole of the top floor of the tower and it boasts a four poster bed, a log burning stove, and a spacious en-suite with freestanding bath. 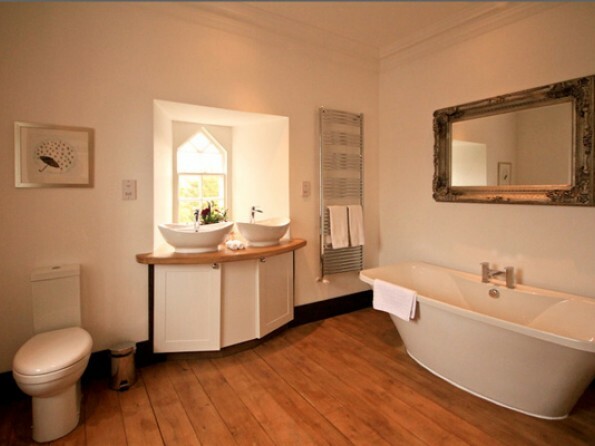 The other bedrooms also enjoy spectacular views and have en-suite bath/shower rooms. Each room is unique but they all have flat screen TVs, iPod docks, hairdryers and tea and coffee making facilities, as well as complimentary toiletries and fluffy towels. You will also have use of a lounge, a dining room, a welcome hall, a kitchen and a utility room. There are 90 acres of formal gardens, woodland and fields for guests to enjoy. 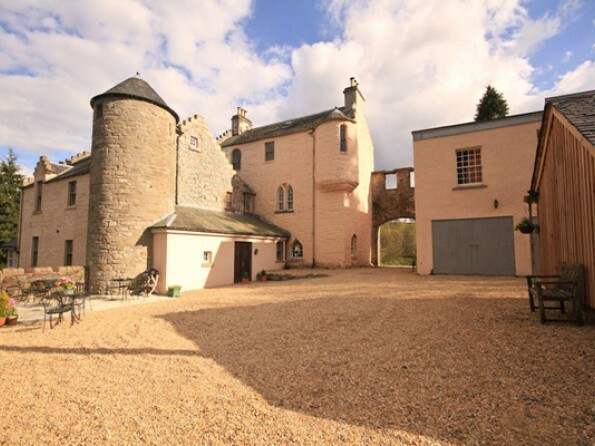 On the estate you can walk, cycle, fish and horse riding or try falconry, clay pigeon shooting and yoga. 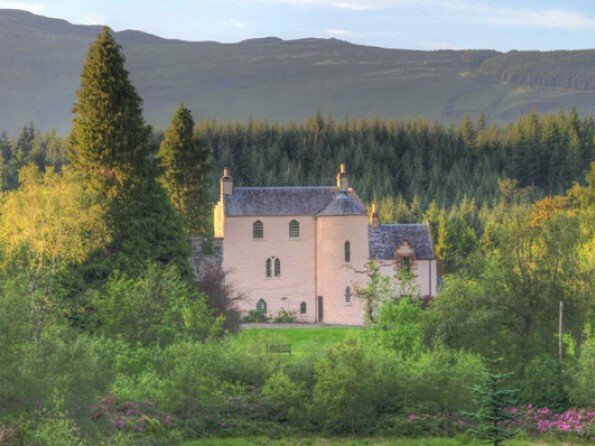 Also on site is the Victorian Gatehouse, Duchray Lodge, which sleeps 5 in 2 bedrooms (5 mins walk from the castle), and the West Wing of the castle which can sleep 4 in 2 bedrooms, so groups of up to 19 can be comfortably accommodated. 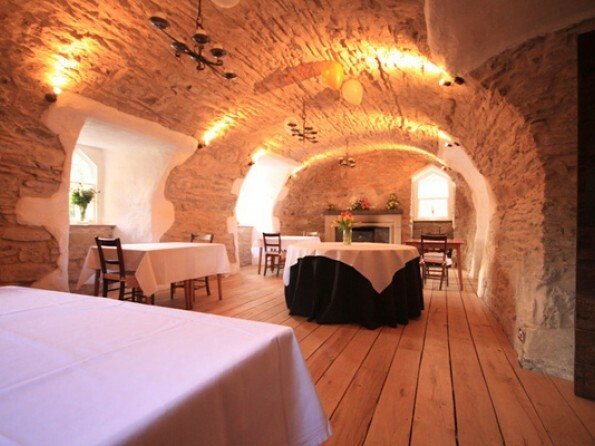 Duchray Castle is also a wonderful wedding and events venue, with space to accommodate 50 for a seated meal. 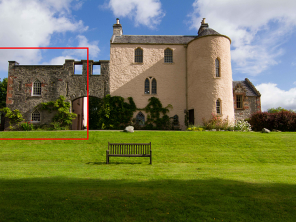 The castle and its grounds are available to hire for filming and photo shoots and for meetings and corporate team building/away days. Please get in touch to discuss your requirements. Special meals and party nights can be arranged. To confirm and secure your booking a non-refundable deposit of £1500 is required. 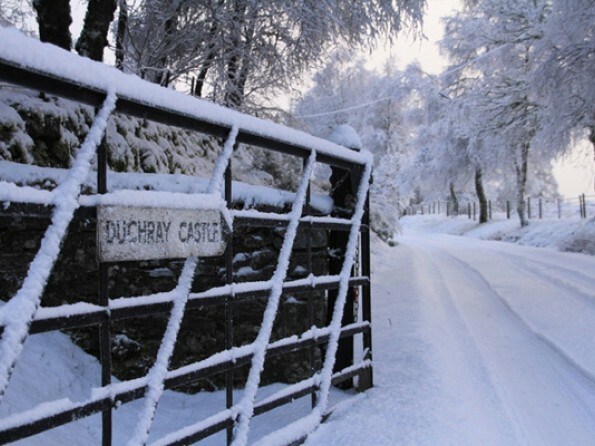 The remainder of the amount is due at least one month prior to your arrival at Duchray Castle. Sorry we can not accommodate dogs in The Castle.